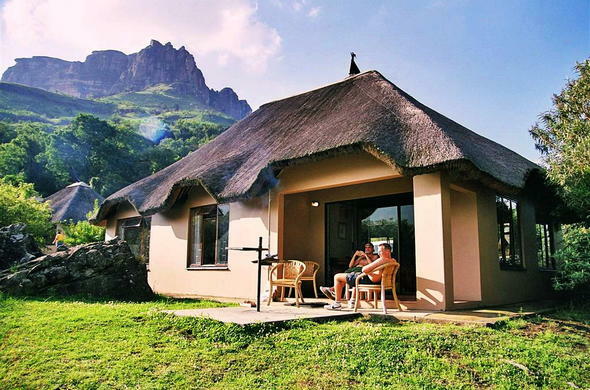 Royal Natal National Park offers Drakensberg accommodation in a variety of lodgings, from Thendele Lodge to charming cottages and bungalows. Thendele Camp at this KwaZulu-Natal nature reserve in South Africa has magnificent views of the world famous Drakensberg Amphitheatre. Situated below the sandstones of Dooley, amidst Yellowwood forests and Protea Savannah, Thendele Camp is divided into upper and lower sections. From this Drakensberg accommodation in South Africa, you can hear the rumbling sound of the Thukela (Tugela) River after a heavy storm, a thrilling experience indeed. Thendele Lodge in Royal Natal National Park in the Drakensberg, South Africa, is a bit away from the main camp and comprises of a comfortable lounge, equipped kitchen and three en-suite bedrooms. A resident cook is available to prepare meals, you will however need to provide your own food supplies. There are also 2x six-bedded cottages available each with three bedrooms, one bathroom, a large lounge, dining room and kitchen. The kitchen is fully equipped with linen, stove, refrigeration, crockery and cutlery. A cook is also available to prepare meals for you. You will need to provide your own food items. A resident cook is available to prepare meals. You will however need to provide your own food supplies. The Lower Resort has 12x self-catering chalets available, each fully equipped with linen, crockery, cutlery, stove, refrigerator and cooking utensils. The Upper Resort compromises of 13x self-catering chalets, each fully equipped with linen, crockery, cutlery, stove, refrigerator and cooking utensils. All units are serviced daily, you will however need to provide your own food supplies and wash your own dishes. Situated below the sandstones of Dooley, amidst yellowwood forests and protea savannah, Thendele Camp is the main accommodation camp at the Royal Natal National Park in the Drakensberg, South Africa. Stay at Thandele Lodge or one of the bungalows or cottages. This Drakensberg camp accommodation in Royal Natal National Park comprises of 26 self-contained chalets with own cooks, which accommodate two, four or six people each.